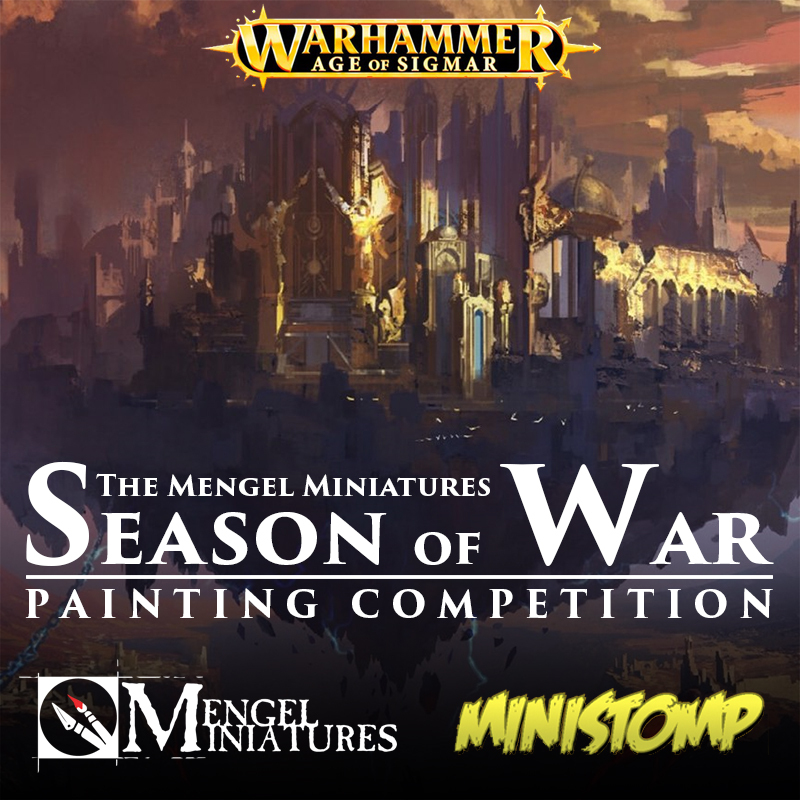 Mengel Miniatures: Season of War Painting Competition Winners! The competition is finally over and man there were a ton of amazing entries. I seriously think this has been the highest quality of entries I have had in one of my competitions yet. After much debating the winners have been decided, so come find out who's taking home the glory, the honor, and of course the awesome prizes thanks to Ministomp. Like I said, this was a seriously tough competition to judge. 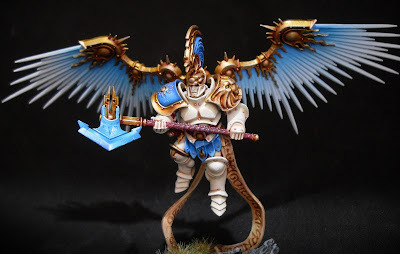 Every one of these entries was a great example of the Age of Sigmar hobby and I'm sure fantastic sources of inspiration to other hobbyists out there. Without any further ado, here are the winners, starting with the Single Miniature. Third place for single mini was a tough one, but ultimately this Bloodreaver Chieftain by Chris won out. 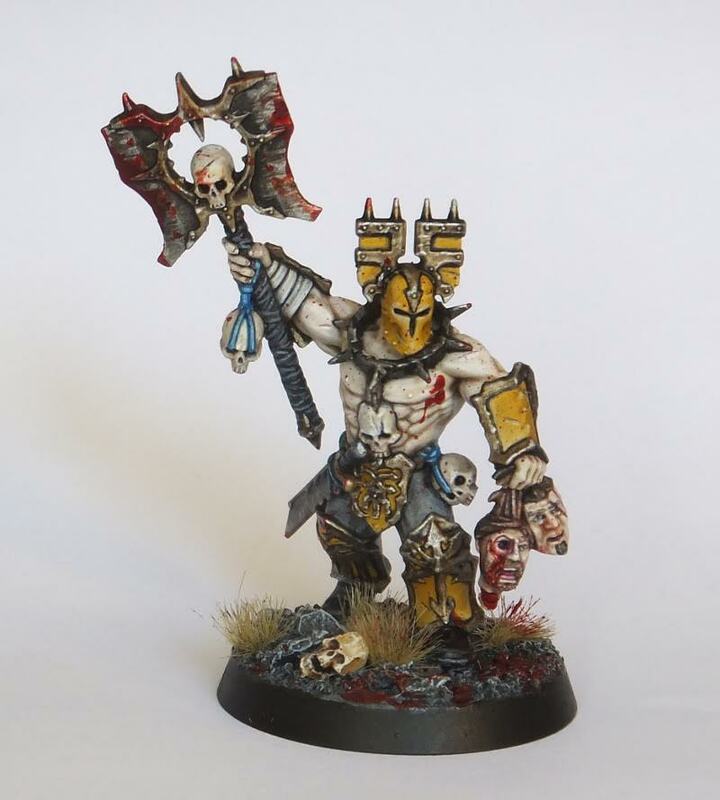 It's painted so cleanly and has such a unique color scheme for Khorne as well. I really like the yellow, which is also a notoriously difficult color to paint. 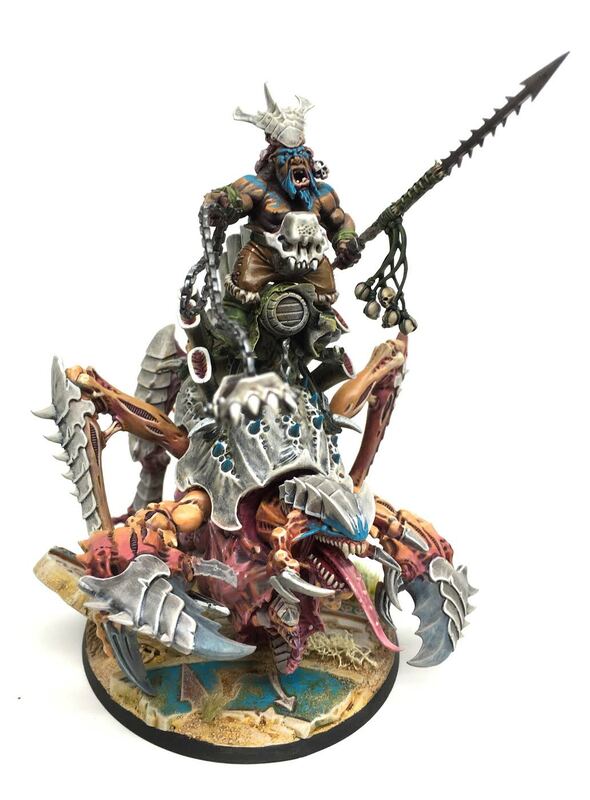 The skin tone is also something I haven't seen before on a GW model and I really like it, again it's also very clean. 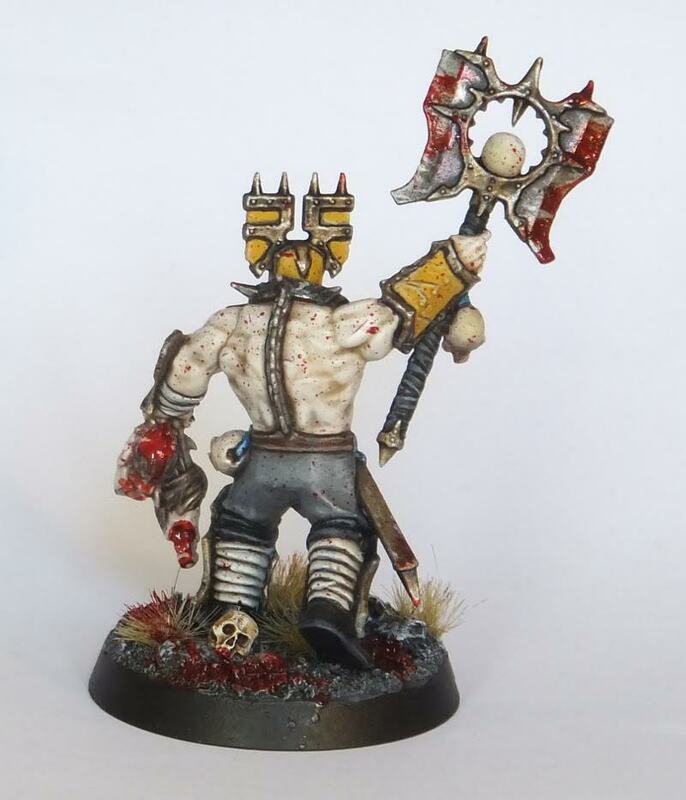 The blood splatters are a perfect spot color on the mini, really popping again the yellow and gold. All in all a really good mini, and a fantastic painting standard for a rank and file model. 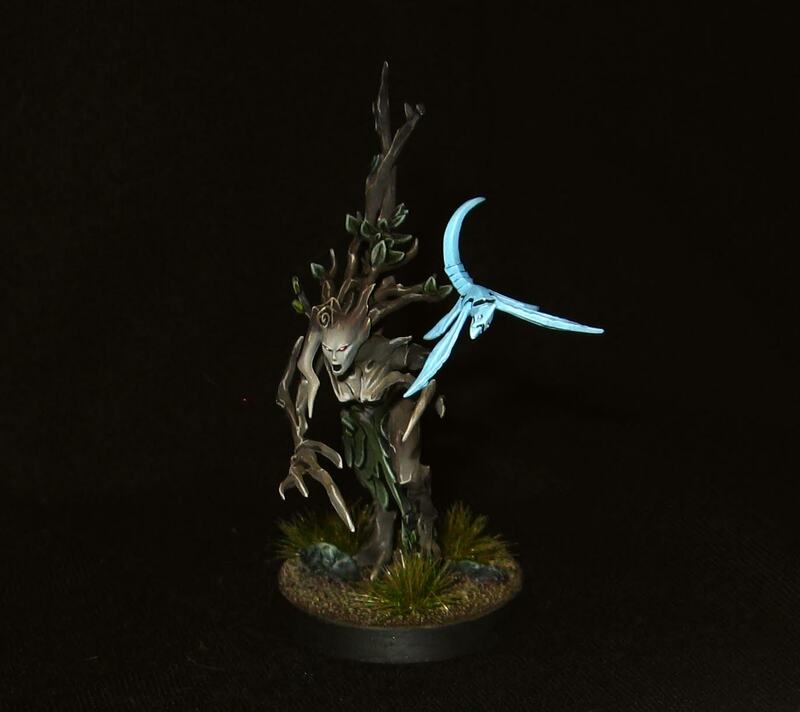 This Branchwraith by Krzysztof was a close contender for first place. I love how clean the transition from the light bark to the dark bark is. 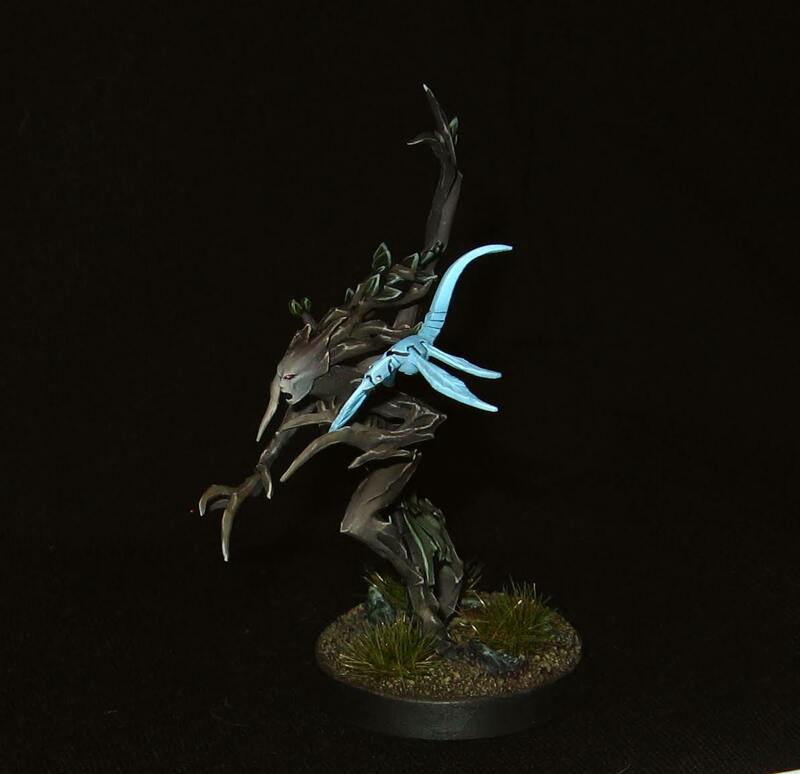 All of the colors are so subdued and realistic it really makes the bright blue spite pop. The face is fantastic on this as well. This is a classic color scheme executed perfectly. The winner of first place in single mini and a brand new Nagash model is this fantastic Stormcast Prosecutor by Bobby Thompson. 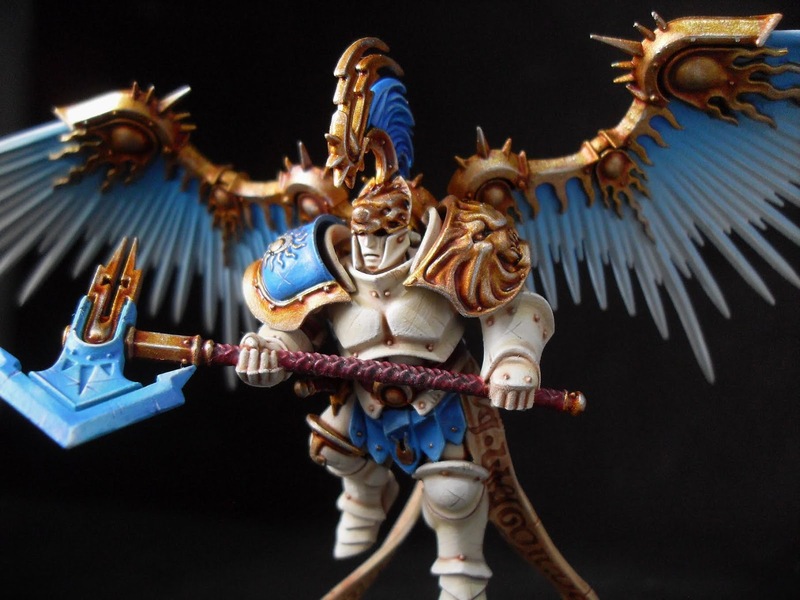 This is a color scheme for the Stormcasts that I really like, and not one I think I've seen outside of the studio. Everything on this is bright and clean, but what really caught my eye are all of the tiny micro scratches painted all of the armor and ax. Man, that ax is nice too, a super bright blue that works very well with the rest of the colors and really pops too. All around a great mini and very deserving of the first place win. Congratulations! I really, really like this mini by Oscar Knutsson. It's a very clean, professional looking paint job with some great color choices and strong highlights. This was nearly higher in the rankings, but was ultimately beaten out. 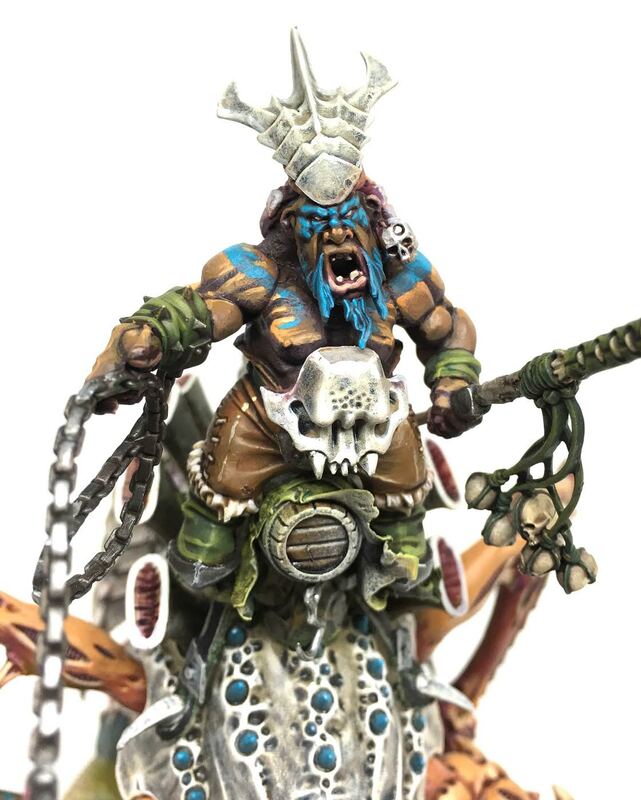 I really do love the whole concept of it though, there's even the severed head of the ogor the Stonehorn used to belong to. That is some great attention to detail right there. Mr. Warhammer Weekly himself, Vincent Venterulla secured second place with this suitably bright Spirit of Durthu. The orange and the blue work wonderfully together and the blends are as smooth as you could ask for. 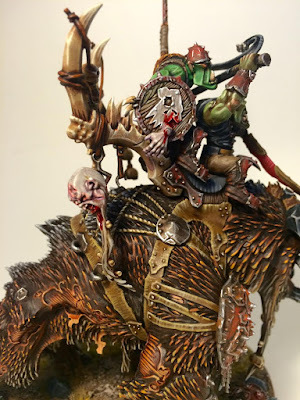 Beyond just the paint job, the conversion is very dynamic and heroic. There is also some really great basing going on here, with the yellowy orange foliage complementing the model perfectly. 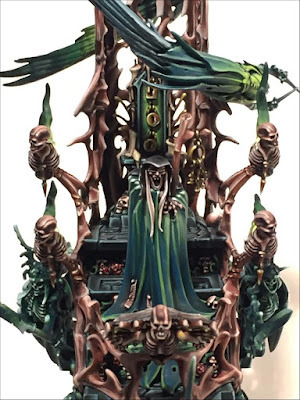 The first place winner for the Unit/Large Model and a brand new Arachon is this very striking Mortis Engine by Bleep Bloop. The highlighting on this is pretty amazing with how stark it is. The transition from dark to light is very extreme, but it works perfectly. The color choices are also very nice, with the warm bone acting as a nice contrast to the vivid teals of the rest of the model. The OSL from the flames on the banshees is also really cool and manages to keep the overall green feel of the model. A well deserved win, congratulations! The People's Choice winner is the Spirit of Durthu by Vincent Venterulla, but it was a close one, with both the Orruk Stonehorn, and the Mortis Engine coming close to winning it. 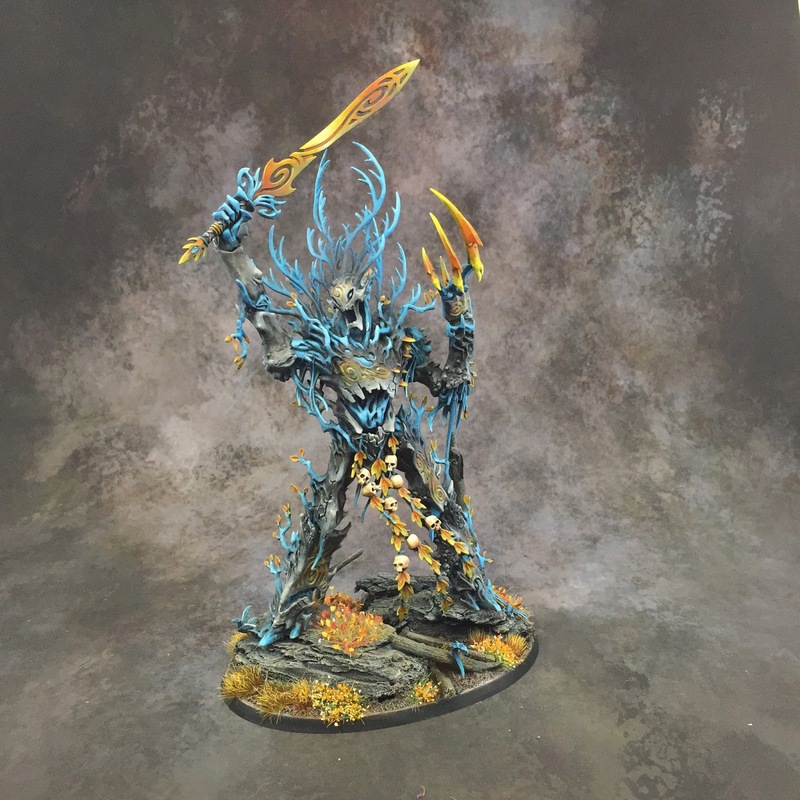 Vincent's model won out in the end though, securing a total of 214 votes to claim the title and a brand new Alarielle from Ministomp. Ministomp chose this decidedly unique and awesome ogor Huskard by the Stonemonk Gamer himself, Eric. I really do love this model and the whole concept of it. 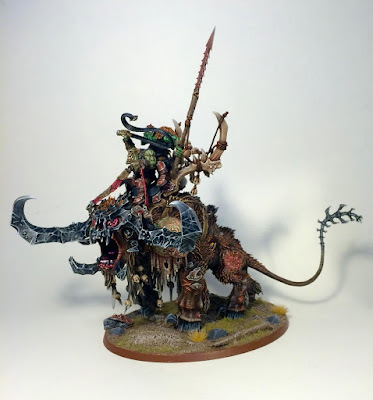 I don't think you'll see another ogor army out there riding Tyranids. I can't wait to see the whole force finished. Those are all of our winners, congratulations to all of you! 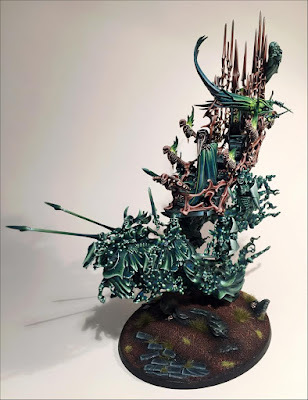 This was a fantastic show of force from the AoS community and I only wish I had more awards to give out to the other minis in the competition. If you haven't already, be sure to check out all of the entries into the competition here. Ministomp will be in touch with all of the winners shortly to set up all of your prizes. Keep an eye out for more competitions in the future. 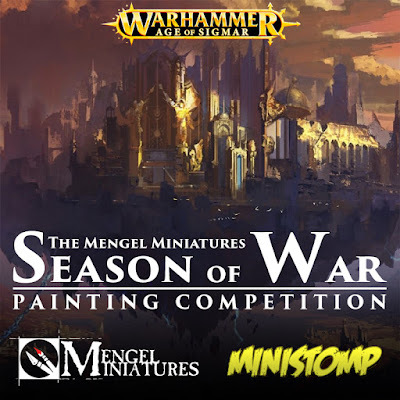 The next one will probably be the 3rd Annual Mengel Miniatures painting competition around the New Year which is open to all game systems and miniatures.